Townsville is a regular stopover for the professional marlin fleet moving north towards Cairns to target light tackle black marlin in August and September. Moreover, a small locally based charter fleet and very active game fishing club members are targeting these juvenile fish from as early as June. Weighing approximately 10kg early in the season and growing to as much and in excess of 30kg by September, the voracious eaters feed on the huge bait schools that congregate in Cape Bowling Green Bay, attracted by the nutrients draining out of the mighty Burdekin River. Where to fish: 8 miles north of Cape Bowling Green in the shipping channel around 27-30m is a good place to start. Other grounds can be found east of Cape Cleveland and off Horseshoe Bay in the same depth, just on the outside edge of the large green zone. Look for the bait schools! Although black marlin are the dominant species, at times good sail fishing can be had as well. The best fishing is usually had by finding the large schools of yakkas or pilchards in the area. How to fish: Most common is traditional dead bait fishing with gar and mullet. Switch baiting live yakkas to hookless lures is gaining in popularity and live baiting on the bait schools can often be rewarding if the sharks don’t clean you up first. Because most marlin are juvenile starting at approx 10kg in May, they are 18-30kg in September, most fun is had on light line e.g. 6kg. However don’t be surprised if the odd larger fish pops up occasionally! 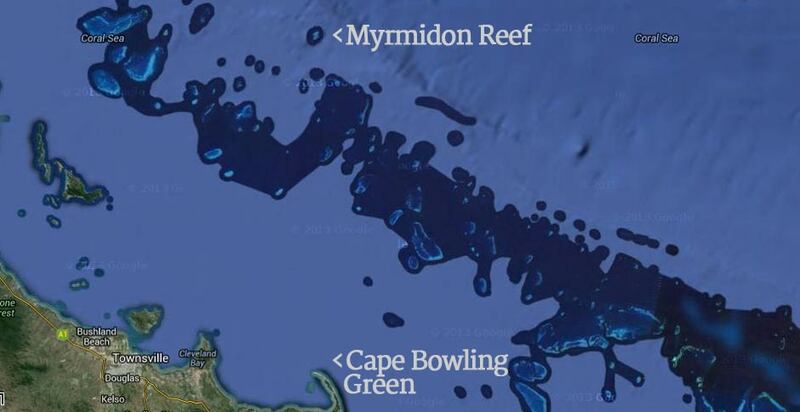 When September rolls around, Myrmidon Reef on the outer Great Barrier Reef, comes on the radar for local boats who regularly enjoy social weekends rafting up overnight in the protected anchorage within the reef itself and fishing just 5 minutes from the anchorage. Again, Myrmidon is a regular stop for the professional fleet targeting giant black marlin and blue marlin, usually on the return trip home to the south after the Cairns season. Because of its unique location – it is a small circular reef surrounded 270 degrees by the continental shelf – it attracts its fair share of marlin and other toothy creatures (it is featured in the capture of most of the Australian dog tooth tuna records!) A great anchorage can be had approaching from the north into the edge of the lagoon safe from all but the worst of northerlies. In October 2007, the first grander in many years for the Townsville GFC club members was weighed at Magnetic Island with the fish being caught off the green zone at Myrmidon. The fish weighed in at 1109lbs and was caught by Mark Hislop fishing with Townsville GFC President Tom Hatrick. Where to fish: The edge of the continental shelf to the north of Myrmidon all the way to Farraday Shoals is often the most productive. Be aware of the green zone surrounding Myrmidon. How to fish: Baits and lures both work well. Luckily Myrmidon is probably one of the best sources of bait fish in the area! Townsville Game Fishing Club home. Kelly’s pictorial article on Cape Bowling on Fishtrack Online. Read all BMFB Blog reports for Townsville and Cape Bowling Green. Popular Post: Townsville Young Guns Notch Up The Marlin. Juvenile black marlin healthy release tips. After many moons of club members fishing predominantly amongst the many reefs off Townsville, it wasn’t until the early 80′s that the Cape Bowling Green billfish grounds were ‘discovered’. Jeff Ferguson and Bill Edwards told of finding similar (to those at Cape Moreton) bait congregations forming at CBG on their yearly sojourns north for the heavy tackle season. Without the time or inclination to investigate further they nevertheless planted a seed with local club members. Finally, in 1983, local Capt Jim Dalling took Jac-Kel down for an exploratory trip to find the place was thick with sails. And although in the early days they didn’t catch too many, word spread amongst the always enthusiastic TGFC members and soon they were all trying their luck. A sailfish haul aboard Chenoa in the 80′s put CBG on the map and people came from all over the world to fish there. Capt. Luke Fallon (KEKOA) took early honours as the first person to catch a billfish in a Townsville Tournament in 1984 (at the ripe old age of 14), and it was a black marlin. A world record on 4kg that stood for a mere 24 hours before another club junior (Leigh O’Brien) caught a bigger fish the very next day. Since that day, literally 10′s of thousands of billfish have been released there. In 1985, Anne Dalling became the first woman in the world to catch a black marlin on 1kg line. And Mike Levitt, the famous light-tackle angler later made the trip himself and landed a much sort after world record after a mere 2 hours of fishing. Fishing CBG: The single best piece of advice anyone gives with regard to fishing at CBG is to find the bait, and you’ll find the fish. Huge schools of yakkas and pilchards still plague the area and the juvenile black marlin set up camp around these schools, literally putting on up to and more than 10kg a season. The stand out year for Cape Bowling Green was 1996 (a 32 black marlin day on board Orca with Capt Jim Dalling and a 36 day on board Assegai with Capt Greg ‘Muddy’ Edwards).